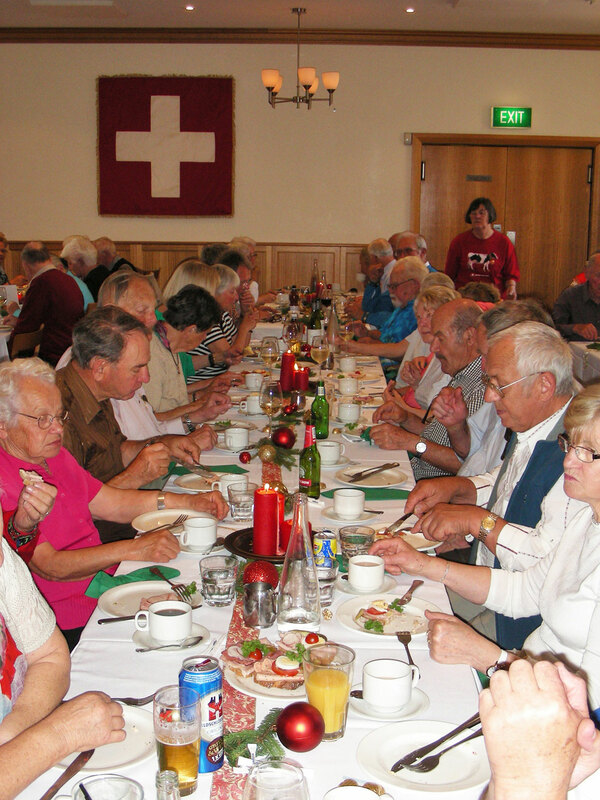 This section of our homepage is for all things Swiss in Australia which are not necessarily associated with the Swiss Club of Victoria. 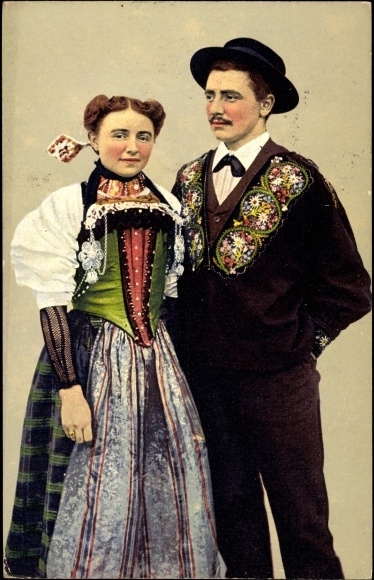 Thanks to the generosity of our members, we are able to display a selection of exquisite Swiss National Costumes including hats and accessories as well as some fine examples of “Chuttelis” for men with beautiful embroideries. Switzerland with its rich history has a distinctive visual style, especially so in its traditional costumes that charm locals and tourists alike. Traditional costumes provide an insight into the textile history of a country or a region. They reveal earlier fashion trends be it the cut, the materials, trimmings, accessories and jewelry used. In addition, Switzerland has a diverse history of textile art, including silk making and embroidery. From St Gallen embroidery, Appenzell hand embroidery, Neuchâtel lace to the Zurich silk industry and the Silk ribbon and ribbon weaving industry, the history of the textile trade in Switzerland is one of success but also crisis, a glamorous world with a shady side. Today, few reminders of its former glory remain. 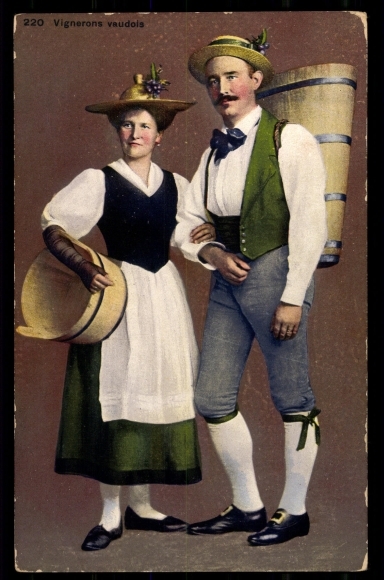 Switzerland’s traditional costumes have been influenced by many different cultures, and yet they remain very distinctive. Costumes were first worn in the 18th century to reflect a growing awareness of rural regional identity and status. During that time, Switzerland enjoyed a period of wealth that allowed for luxurious, creative embroidery and lace-work. 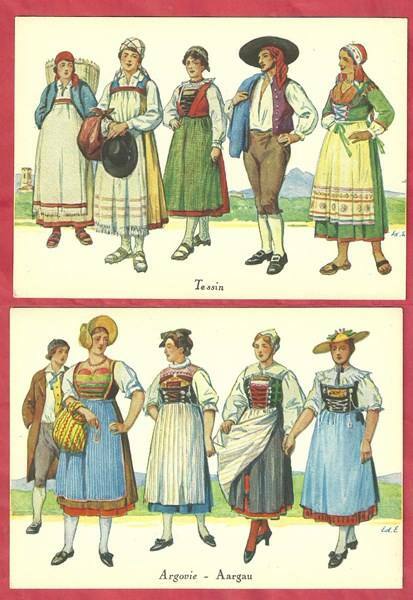 That influence is still seen in traditional Swiss clothing today. The traditional dress vary from canton to canton. Women‘s costumes in particular often differ within the regions of a canton, virtually all of which have festive and everyday costumes. Today, unlike in Germany & Austria, where they remain an every day clothing item, Swiss traditional costumes can mainly be seen at cultural events and processions. Striking examples of traditional costumes are the black Bernese costumes embellished with silver or the Engadine costume made of red wool. Jackets often feature complex embroidery on the cuffs. Silk ribbons adorn straw hats, and many regions include silk aprons as part of their traditional costume. 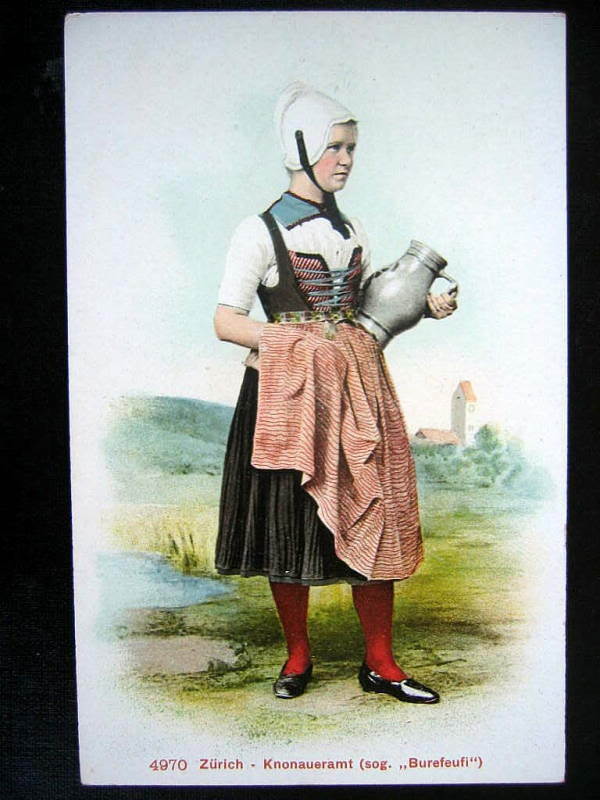 Most commonly seen in the canton of Zurich are the Wehntal costume, with its bright blue apron, and that of the Knonauer Amt region, the Burefeufi (named after the V-shaped apron tied round the back). When it comes to men’s traditional attire, the “Berner Mutz”, an embroidered black jacket with short sleeves, is generally well known, as is the “Appenzeller Sennentracht” with yellow trousers and a silver spoon earring or the embroidered blue blouse of Central. 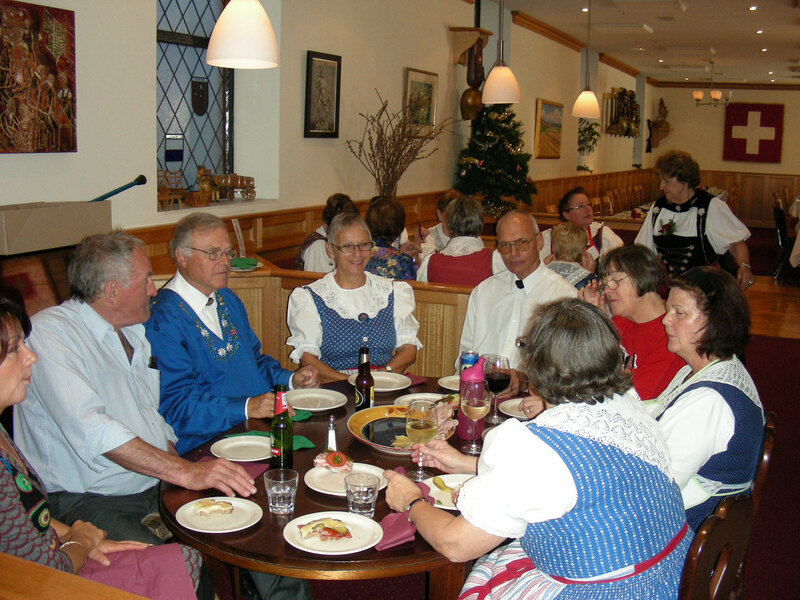 The Swiss National Costume Association oversees representations of Swiss traditional dress in the media and arts and holds a national costume gathering each year. Learn more about the beautiful Swiss traditional costumes on 1 August from 11.30-4.30 pm on the Second Floor at the Swiss Club. Who knew that the first known recipe for fondue is listed in a Zurich cookbook published in 1699? When the first flurries of winter creep over the land, thoughts turn to comforting foods like fondue. 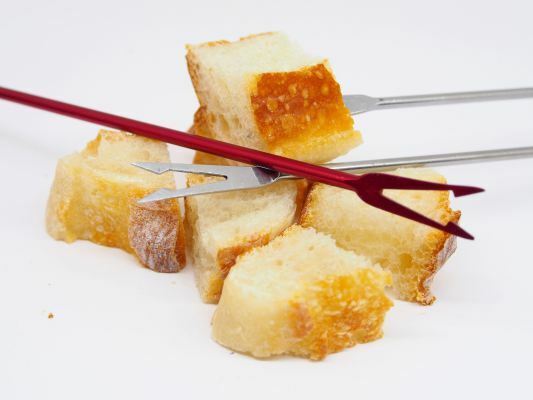 When people think of fondue they think of pots of melted steaming cheese, and bread. Inspired by the alps, and visions of “The Sound of Music“, fondue parties became popular in the 1970s, and diversified to the likes of fondue bourguignonne where meat is cooked in oil, fondue chinoise (basically a hot pot using broth), and the ubiquitous chocolate fondue. At one point it may have gotten out of control somewhat, as humorist writer Eugene Epstein, remarks upon in his 1968 book “Once upon an Alp“. Tongue in cheek he mentions fondue irlandaise, which is new potatoes cooked in boiling water, and fondue suédoise – meatballs cooked in whale oil.